Who would have thought that a cupcake would make a wonderful holiday card? The things that Karen Lockhart comes up with never cease to amaze me. I arrived at her place one day to see a series of festive holiday cupcakes on her coloring table. I asked her if I could play with her idea and this is what I came up with. The little holly leaves are just added using a fine-tipped Zig Micron pen. The wonderful scalloped strip was created using my amazing new cutter (more information to follow shortly - I'm in the process of reviewing all the positives and negatives) and the crop-a-dile. It is fantastic being able to set the depth on the crop-a-dile so that each punch is the same distance in without a lot of thought having to go into planning this out. I am having so much fun with this cutter creating a "Doodlebug" type of effect similar to their paper frills. The paper is Memory Box, these are in the Christmas Brights collection. I love how the KI Memories accents (paper clip and brad) work perfectly with these colors. The greeting is an A Muse sentiment that I masked off and stamped only the "sweet" completing it with my Dymo Labeler and some of the colored tape I had purchased ions ago to do something like this. In hindsight I wish I had made the card a 6x6 size, so that my greeting didn't feel squeezed, but it will have to do for now. It just felt wonderful to stamp this creation tonight. Now it's off to bed and hopefully I'll have time to write my review about the cutter, do my projects that are due this week, and finish up my website. I can hardly wait to share the wonderful papers and stamps with you that I have lined up! Oh Ellen this is adsolutely gorgeous! 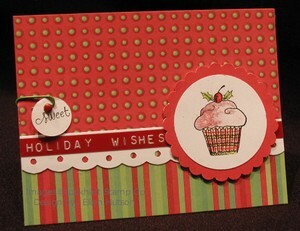 love the papers and the cupcake stamp!!!! Ellen, how adorable! I love the Christmassy look and the cupcake looks so yummy! Great job! As always, YOU never cease to amaze me either Ellen! It's so beautiful.